Every person who is a member of Christ's Church is a believer, and every believer is a member of Christs Church. We learn in Acts 5:14 that B______________________ were ________________ to the Lord (see also Acts 2:47). The moment a person becomes a believer he is added to the body of Christ, and thus he becomes a member of the Church. There are no unbelievers in the body of Christ. Every believer is baptized (placed) into the body of Christ the moment he believes (see 1 Cor. 12:13). FAITH (belief or trust) is not some difficult thing which no one really understands. People walk by faith every single day. When you sit down in a chair you have FAITH in that chair and you BELIEVE that it will hold you up and not break into pieces when you put your weight upon it. When you drive in your car you TRUST the brakes and you BELIEVE that when you need to stop suddenly your brakes will work. If you fly from one city to another, you have FAITH in the airplane and you TRUST that it will carry you safely to your destination without crashing to the ground. Whenever you eat food, you TRUST that the food has been properly prepared and not poisoned. When you go down into your basement, you RELY UPON the pillars and walls that hold up the ceiling over your head, and you BELIEVE that the house will not come crashing down upon you. When you climb a tree and hang all your weight upon one branch (30 feet above the ground), you TRUST that the branch is strong enough to hold you up. Every time you drive or ride your bike over a bridge, you DEPEND UPON that bridge to hold you up and not collapse into the water or onto the highway below. When we pet a big dog, we TRUST that it is a friendly dog and that it will not bite our hand off. When your friend tells you that he will meet you at the park at three o'clock the next day, you TAKE HIM AT HIS WORD and BELIEVE that he will do what he said he would do. Can you think of other examples of how we live by faith every day? Sometimes the brakes in a car do fail and a person might have an accident. Sometimes airplanes do crash and lives are lost. Sometimes chairs do break when people sit in them. Sometimes the food we eat is bad and it might make us sick. Sometimes the roofs on buildings do come crashing down. Sometimes branches do break when we climb trees. Sometimes friendly looking dogs do bite. Sometimes our friends do not keep their promises. Is it possible to trust something or someone that will never fail us? Is there someone that we can put our faith in who will never disappoint us or let us down? What does it mean to believe in the Lord? A missionary was once translating the Book of John into an African dialect. He had great difficulty in finding a word for the important word "believe" (which occurs frequently in Johns gospel--see for example John 1:12; 3:16,18,36; 5:24; 6:35,47; 7:38; 8:24; 11:25-26; etc. ), so he had to leave it blank. He continued his work but was constantly baffled by his inability to translate this key word. One day a native came from another community with a message of great importance. He had been running through the tangled underbrush for hours and so was completely exhausted. He blurted out his message and, being at the end of his endurance, threw himself upon a nearby hammock. As he went limp he breathed a sigh of relief and uttered a word in the African dialect which was new to the missionary. The missionary asked the natives what the runner had said. One replied, "Master, it means I am resting all my weight here.’" "Thank God," said the missionary, "that is just the word I need for believe,’" and he proceeded to complete his translation. So too, believing is simply casting ones self unreservedly into the open arms of the Lord Jesus and saying, "Lord, on Thee I rest my soul for eternity. I am trusting Thee to hold me up and to keep me safe and secure forever! I am depending on You and on You alone to save me! I am resting all my weight upon Who You are, and what You have done and what You have said." Yes, God wants us to lean with all our weight upon Christ. We must cast ourselves upon Jesus and rest in Him and commit ourselves completely to the One who is able to S__________ (Hebrews 7:25). He is our only hope of salvation! What does it mean to believe on the Lord? Another illustration might help. The story is told of an expert tightrope walker whose tightrope was extended across Niagara Falls. Of course, to fall from this rope would mean instant destruction. Balancing his long pole lightly, he steps upon the rope and starts across. The crowd is silent. Finally he triumphantly places his foot on the farther bank and a great cheer rises even above the noise of the falls themselves. The man then turns to the crowd and makes a thrilling proposal. He offers to recross the falls with a man on his back! But who is to be the man? "Do you believe I am able to carry you across?" asks the ropewalker turning to a likely individual. "I certainly do," at once responds the one addressed. "Will you let me?" inquires the waiting hero. "Will I let you? Well, hardly. You dont think I am going to risk my life like that, do you?" and he turns away. "And what about you?" as he asks another man who was standing by. "I believe. In fact, I have no doubt about it at all." Breathlessly the people watch as he climbs onto the tightrope walkers back and they begin step by step. At last they are over; their final step is taken and they stand once more on firm ground! Bridging the gulf between time and eternity is the great rope of salvation. Jesus Christ alone is able to cross it. You may have heard all about it, and, like the first man, you may even believe that Jesus can carry you across. But not until you take the final step and commit yourself to Him will you ever get over. God wants you to trust yourself completely to His Son. There is only one problem with this illustration. It gives the idea that trusting the Lord Jesus is something very dangerous and risky. Nothing could be further from the truth. Indeed, trusting Jesus for ones eternal salvation is the safest thing a person can do! Human tightrope walkers sometimes fail and some have even plunged to their death. The Lord Jesus Christ has never failed and never will. Those who come to Him for salvation will never be disappointed! Read John 6:37. Have you done this? 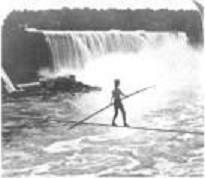 The greatest 19th-century tightrope walker, Jean Francois Gravelet – alias Charles Blondin – (1824–1897) of France, made the earliest crossing of the Niagara Falls on a 76 mm (3 in) hemp rope 335 m (1,100 ft) long and 47.75 m (160 ft) above the Falls on June 30, 1859. Try to live a good life, and thou shalt be saved. Keep the Ten Commandments, and thou shalt be saved. Love your neighbor, and thou shalt be saved. Be baptized, and thou shalt be saved. Observe the mass and the sacraments, and thou shalt be saved. Do your best, and thou shalt be saved. Go to church every week, and thou shalt be saved. Live a good life and thou shalt be saved. Do good works and thou shalt be saved. Say prayers to God and thou shalt be saved. But man's way will never result in salvation (see Proverbs 14:12). What does God say a person must do to be saved (Acts 16:31)? ________________________________________________ Note: If you ever meet a person who belongs to a cult or false religion, you can always ask him this question: "What must a person do to be saved?" Listen carefully to his answer and see if his answer is the same as what God says in Acts 16:31. Does he agree with God or disagree with God? Test all things by the Word of God ["Prove all things"--1 Thess. 5:21]. 3. ____ The moment a person believes he is sanctified (set apart as Gods special person). He is set apart to serve the Saviour. C.
Have you put your faith in a faithful Christ? Are you trusting Him for your eternal salvation? There is no other way to be saved (Acts 4:12; John 14:6). There is no other way to become a member of the true Church.